Yes, it is October and as usual this fall we will be doing our Stewardship program called Consecration Sunday. It is also true that in the fall, we begin planning for the next calendar year and what you give to ministry at Good Sam will certainly have great impact on what we can accomplish next year. But it is not true to say that our Stewardship program is about getting you to give to what we want to accomplish next year! 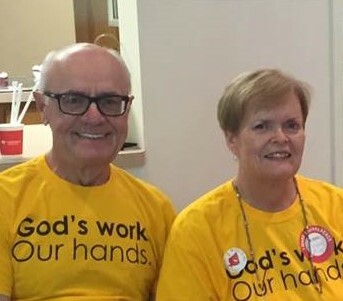 There is a very different focus, connection and emphasis in our Stewardship programs here at Good Sam. My purpose here is to remind or tell you about this different focus here at Good Sam. In worship, we sometimes remind you that, giving can be an act of Worship. We hope you have had a chance to think about the giving you do at Good Sam and you are also in the process of learning how to make your giving, a worshipful experience. Giving is learned. And learning to give is also a part of our spiritual journeying. Why is this so? I think about it this way: When we give, we have the opportunity to connect how we give with learning to set ourselves aside, to practice letting go, seeking to discover what God is doing with us, as opposed to what we would do with ourselves. Jesus invites us to love God with all our Mind, strength and will and to love our neighbors as ourselves (Matthew 22:34-40). It is pretty hard to do this if we continually focus mostly on ourselves and what we want. Learning to place ourselves in God’s hands is an essential activity in the journey of faith. Learning to celebrate God’s activity in our lives and respond to that Grace with Thanksgiving is also an essential movement in the journey of faith. At Good Sam, each fall, we invite you to pick up your own progress and growth in these movements of faith and decide with God what steps you might take to grow in giving, letting go and trusting God will your whole life, and then turn to God with Thanksgiving. When you start receiving information about this year’s Stewardship program at–called “Giving and Growing in Faith”–we hope you will stop to reflect on your own need or interest to grow in faith and invest yourself in this essential movement of growing in faith. As always, we will make good and faithful use of everything you share with us to support life and ministry at Good Sam and our work in the community of St. Mary’s County and beyond. October 17 ◊ Viewing of “The Idea that Changed the World” a Docu-Drama of the life and impact of Martin Luther 6:30 pm to 9 pm at Good Sam. Admission is free and refreshments will be provided. Sponsored by Trinity and Good Samaritan Lutheran Churches. 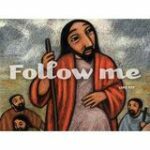 Click Faith Review to take our Faith Journey Review (print from .PDF format); Click Faith Journey Review to take the Review online (in Google Forms format). In an effort to get acquainted with everyone and get to know our families and friends, each week we will spotlight on a Family or Friend of Good Sam Lutheran Church, In addition we will be posting pictures and locations of where our families are originally from in the Fellowship Hall on the Big US Map. It’s interesting to see where we all hail from. We truly are Finding our neighbors along the journey of faith! Chuck and Ginger Latyak joined Good Sam over 10 Years ago and have been very active in the congregation. They are blessed with 2 daughters and 5 grandchildren. They have been happily married for 50 Years! Chuck is originally from Garfield New Jersey and Ginger is from Fair Lawn New Jersey. Chuck is a Navy Veteran and Retired from the New Jersey Turnpike Authority. Ginger attended a Kansas Missouri trade school and retired as a Pre-School teacher. They have lived in Southern Maryland for over 10 years. Chuck enjoys Photography, Woodworking and Sailing and Ginger enjoys Sewing, Quilting, Crocheting and Cooking. Stop by and introduce yourself if you have not met them. Take the Journey With Us! 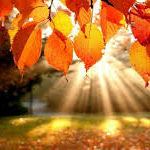 Every year we take some time in the fall to think about our giving and the role of stewardship in our faith journey. We invite our community to think about growing into their faith journeys through how they practice giving. We say, “Giving is an act of Worship.” This year our theme is “Journey to Generosity.” We learn generosity along our faith travels from God who gives faithfully and generously to all. We are all on the journey of learning to give up and let go of our self-centered and selfish attitudes and behaviors. Loving God is a great gift for turning away from selfishness to a better life, blessed and blessing others with what God has given us. Again, this year, we invite you to find your next step along the journey of faith called learning to give as God gives to us; freely, abundantly, with passion and joy and peace. We know you will be blessed in the process. Journey to Generosity begins in early October with a new Devotional Booklet that 21 of our members have participate in writing. These are our shared thoughts about what has been meaningful to us as we have journeyed to generosity. You will receive email notices about this program and email invitations to read these daily devotions. 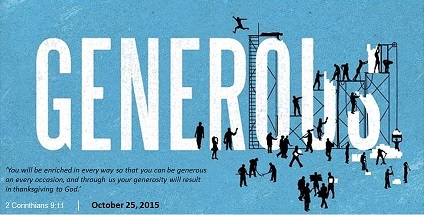 Consecration Sunday is the Climax of our Journey to Generosity Program. We will have one combined Worship service (11 am) that day with an all congregation learning event at 10 am called “Gifted and Giving.” Because, after all, we are a Gifted and Giving people. And you won’t want to miss the Celebration Luncheon on October 23rd at noon. It’s a catered meal to which you are invited to RSVP. There we will celebrate what we will give toward ministry and service in the coming year. No one will come and ask you for money or commitment. You will be informed, invited and encouraged to participate. There will be fun and community sharing about the things that happen to us along this kind of faith journey. How you engage this time, this journey and your growing in faith with God is up to you. But, we are praying that this conversation will be fruitful for you and for the community in which you have chosen to worship. Turn in an Estimate of Giving Card in Worship on Consecration Sunday (October 23) . Celebrate with us on October 23rd at lunch right after Worship. Hear what we will accomplish together this year. Join us on an all congregation “God’s Work. Our Hands.” group outing on Saturday, September 10th, (9 am to Noon) at Farming 4 Hunger. Sign up here or on the bulletin board in the Fellowship Hall to join us on Sept 10, 9 am to Noon. Please remember to bring along a signed and printed F4H waiver, cold water, sunscreen and wear closed-toed shoes. Located at: 6932 Serenity Farm Road, Benedict, Maryland 20612. From Lexington Park: Take Rt. 235 to Rt. 5 towards Hughesville. Turn right on Rt. 231 toward Prince Frederick. The farm will be on your left, before the Rt. 231 Bridge across the Patuxent. Park and meet at the first large farm building with the greenhouse in front. 9:25 – 10:45 am Activities: Gleaning and picking of what is in season; packing up food boxes; and other helpful activities. An animal tour for the kids may be organized. 11:00 – 12:00N Staff introductions and stories, photo galleries, and group pictures. Farming 4 Hunger (F4H) is a 501(c)(3) non-profit organization formed in 2012 to serve those in need of fresh food in Southern Maryland. 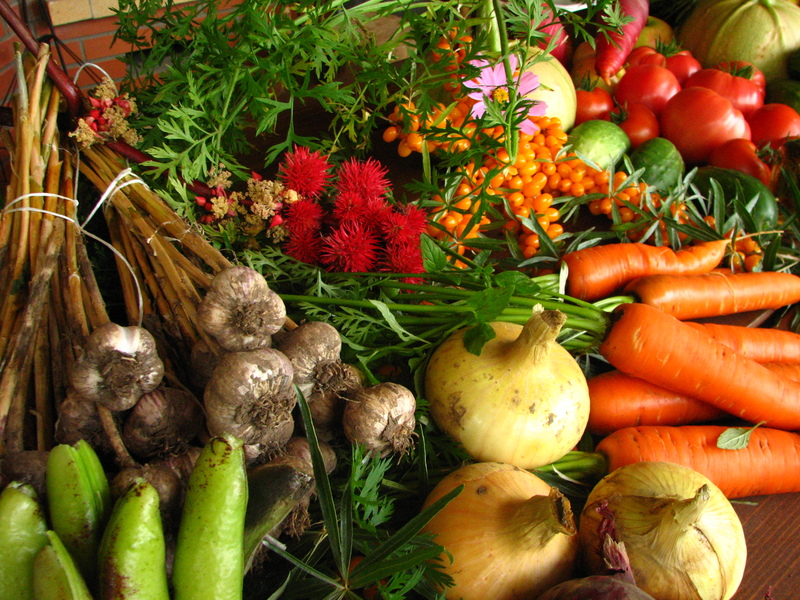 The organization grows and distributes over a million pounds of locally grown, fresh food each year. Bernie Fowler Jr., founder, had a vision through his own personal struggles to help people in his hometown gain better access to fresh fruits and vegetables. Bernie was tired of only seeing nutrient-poor foods (canned and boxed goods) going to food banks, aiding in Americas ongoing struggle with childhood obesity and diabetes. He also realized local farmers were struggling to make ends meet. People were being fed, yes, but he realized that we as a community must do better. F4H accomplishes its mission through unique partnerships with 27 local farms, 20+ churches, local businesses and schools, the Maryland Food Bank, the Department of Corrections, and a great network of community volunteers. Our Mission is to feed the hungry and help feed the soul. Hunger comes in many different ways. Healing the mind, body and spirit is at the core of Farming 4 Hunger. We believe if you serve others, you too will be fed. Living Lutheran, the new flagship publication of the ELCA, has officially launched. 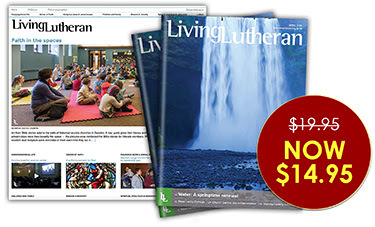 Beginning with its April issue, The Lutheran magazine will be called Living Lutheran and will have an accompanying website, LivingLutheran.org. Our new name signifies this church’s living, daring confidence in God’s grace. Your new Living Lutheran has a bold, modern look and will continue to offer stories, reflections and news that illuminate Christ’s presence in the world. A free e-digest highlighting the latest and most popular stories, an introductory offer on new print subscriptions and more! Join the conversation! Visit the new Living Lutheran today. On October 25th, we’re celebrating Consecration Sunday with one special service at 11:00 am followed by a celebratory luncheon at 12 noon. This will be our only worship service for this day. Please come and join in this special worship experience and meet our guest speaker, Reverend Dave Sonnenberg, from Good Shepherd Lutheran in Gaithersburg MD. Pastor Dave is the Senior Pastor at Good Shepherd Lutheran where he has served since 2001. He chaired the Stewardship and Mission Table for our synod from 2009-2014 and has a passion for helping the church grow in generosity. His optimistic and hopeful leadership has enabled Good Shepherd to keep focused on reaching out in an ever changing world. For the last 2 years, his congregation has been in a supportive and creative partnership with Epiphany Lutheran in Burtonsville, Maryland. He is married to Frances Foltz (who works as the Christian Ed Director at Good Shepherd) and they have 3 children; Rachel (19), Becca (17), and Drew (15). Rachel is a Sophomore at St. Mary’s and is on the swim team. Pastor Dave ventures down to all of her meets so he has become very familiar with St. Mary’s County! He is an engaging speaker and we are excited to have him with us on Consecration Sunday. A full bio is at- www.goserve.net/pastordave. Please plan on worshiping with us on this day and sharing in our Celebration Luncheon with the whole congregation. This will be a catered meal, and we hope everyone will be there. Soon you’ll receive a Reservation Card for this special Sunday’s worship and festive meal. It will be very important that we hear from you, so please complete your card when received. We are looking forward to a day filled with worship, fellowship and thanksgiving for the generous gifts God has provided us–so that we may share them with others. At Good Samaritan Lutheran Church, we believe that God would like us to approach stewardship from a biblical perspective rather than merely a way to pay our bills. We believe that our financial contributions can be a way to help people grow spiritually in their relationship with God by supporting our church’s mission and ministry with a percentage of their incomes. Our congregational council has selected the New Consecration Sunday Stewardship Program as a way to learn about the biblical and spiritual principles of generous giving in our stewardship education emphasis this year. During morning worship on Consecration Sunday, October 25th, we are asking our attendees and members to make their financial commitments to our church’s outreach, benevolent, and educational ministries in this community and around the world. Every attendee and member who completes an Estimate of Giving Card does so voluntarily by attending morning worship on Consecration Sunday. We also urge people to attend who are opposed to completing a card. The procedure will be done in such a way that no one should feel personal embarrassment if he or she chooses not to fill out a card. We will do no home solicitation to ask people to complete cards. During morning worship our guest leader will conduct a brief period of instruction and inspiration, culminating in members making their commitments as a confidential act of worship. The Consecration Sunday team and congregational council request and encourage your participation in Consecration Sunday events. Since we will make no follow-up visits to ask people to complete their cards, we will make every effort to inform, inspire, and commit everyone to attend Consecration Sunday worship. Thanks in advance for your enthusiastic participation in Consecration Sunday events. We have an exciting addition to our web presence: the ability to give online. Now you can make a gift or pay an activity registration fee anytime from anywhere you have web access. Here is the link – (Give) it a look. You can find this link in the welcome page of our website and on the “About Us” page under Resources. Here are some things you should know about online giving. You can make a gift from your credit card or an Electronic Transfer from your bank account. Please note: The fees we pay for this activity are significantly less for electronic transfers than for Credit Card gifts and you have the option of including an additional amount to cover the fee of a credit card gift if you so choose. Please consider scheduling your giving to Good Sam through an automated payment method. My family has been using Bill Pay at our bank to make our church contributions for some time now and have just switched to electronic transfers through the website. This is the most efficient method for the church, for us personally and for the bank too. No postage, envelopes, or checks and the money is deposited directly into the church’s account. Simply Giving is another method of making a recurring gift. It is a scheduled and preauthorized agreement to electronically debit your account for a gift to Good Sam. Talk to Rich S. if you would like to explore this option. Thank you for all your faithful participation in life and ministry at Good Sam. Your consistent giving while you are away for Summer Holiday is another way you can support our work and mission together. In the pews now, you may notice a new laminated pew card for online giving. This card has two purposes. 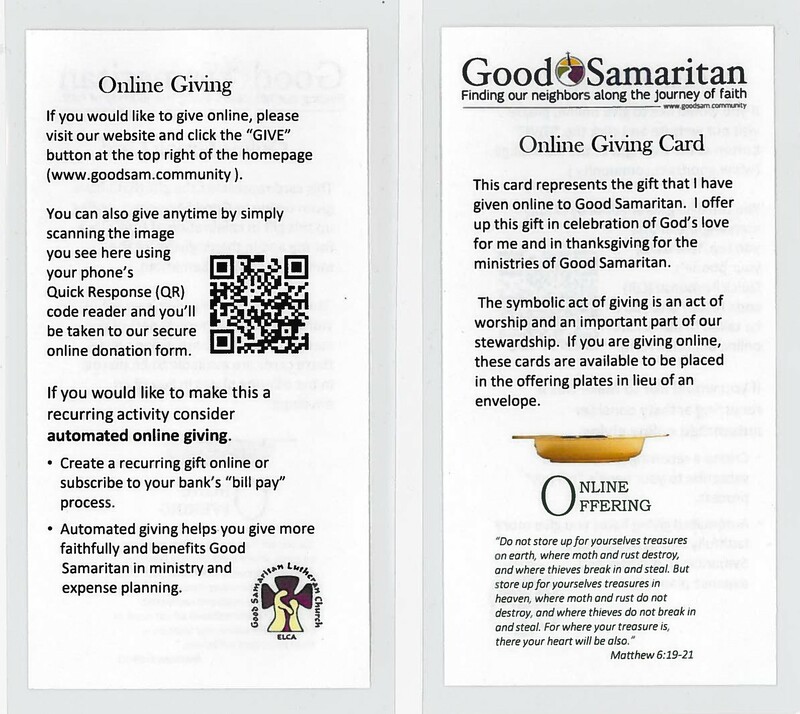 First, if you are making your offering gifts to Good Sam through bill pay, Simply Giving or another automated process, we invite you to use this card and place it in the offering place as it is passed. It will give you a physical activity in worship to add to the quiet behind the scene activity of your automated giving. Second, notice the QR code on the back of the card. This Quick Response code can take you directly to our website giving page where you can make an online donation. You can do this anytime, from anywhere, but we invite you to make use of it in worship if it is convenient for you. Give it a try. You can also place this card in the offering plate to acknowledge the gift in a physical way. If nothing else, your pew neighbors will be impressed that you know what to do with that new pew card. First Quarter Giving Statements are ready for pick up. Please save us the stamp and pick yours up soon. They will be available in the Worship entry way for a couple more weeks.